The gallery short-code has to be invoked with type='smugmug' to invoke the SmugMug functionality. Click on the links above to see examples. Note that you need to obtain an API key from SmugMug for this. The API Key has to be entered in Settings → Photonic → SmugMug → SmugMug Settings. If you are displaying regular SmugMug photos, albums and folders (i.e. you have no private photos to display) you don’t need do do anything specific. 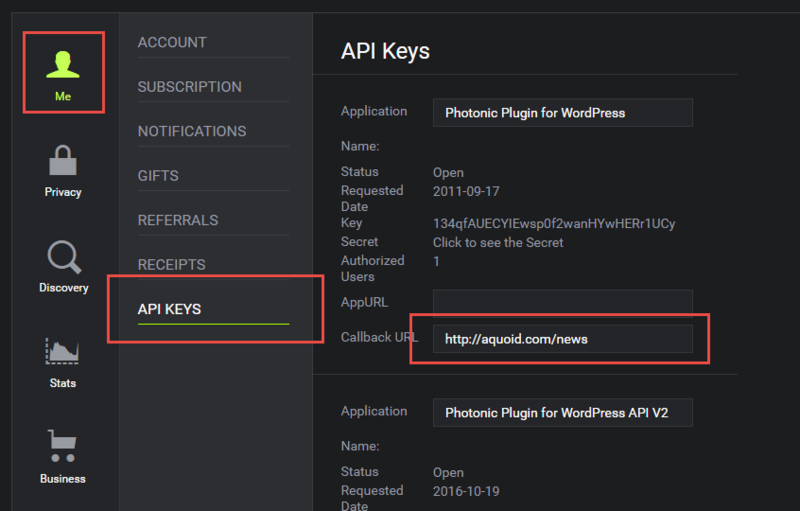 You don’t need an API key, and the plugin will work straight out of the box! But if you want to display private photos or albums or folders, you will need to set up authentication, and for that you will have to obtain an API key. This is an easy process, and you can read below for the steps to do this. You can save the above in Photonic → Settings → SmugMug → SmugMug Settings → SmugMug API Key and Photonic → Settings → SmugMug → SmugMug Settings → SmugMug API Secret. Then, in the resulting window, you can set the Callback URL. Note that this step is not needed for Back-end authentication. Read more about the two forms of authentication. Instead of the “Aquoid” URL, use the URL provided in your Settings page. Now you should be done. 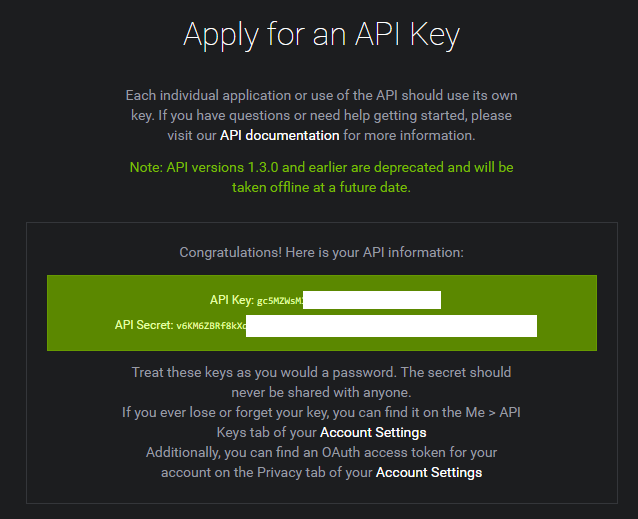 If you had created your API keys before December 2016 (i.e. 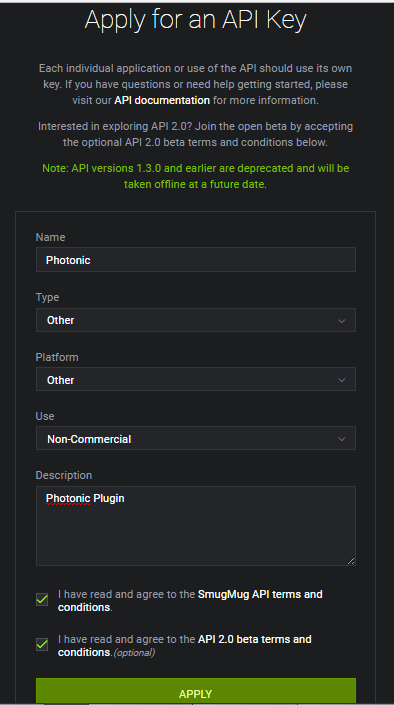 before version 1.57 of Photonic), please read the following section. Login to your Smugmug account. 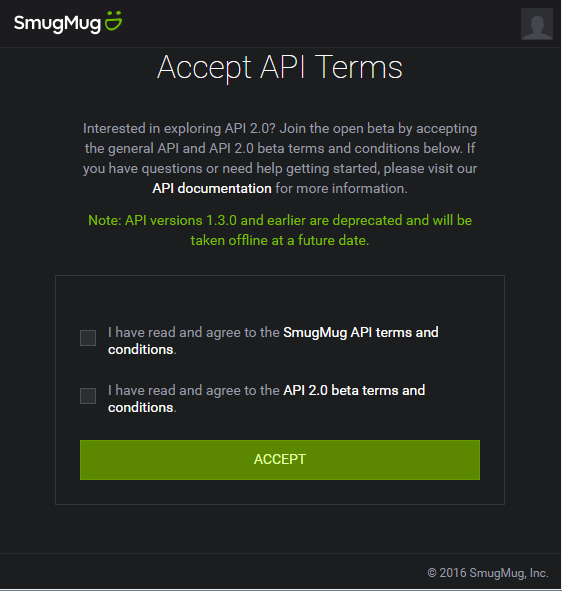 Go to the API Terms of Service at https://api.smugmug.com/api/developer/accept. If you accept the terms of service, select the two checkboxes and click “Accept”. That’s it. Your galleries will now show up!